Good Morning, this is Capital Essence’s Market Outlook (the technical analysis of financial markets) for Tuesday February 12, 2019. We’ve noted in the previous Market Outlook that: “S&P remains in a consolidation phase, which represented the digestion period in the aftermath of the January upswing. While near-term risk skews toward further weakness, the overall technical backdrop remains positive so sell-off should be shallow and quick because the sideline money will try to fight its way back into the market.” As anticipated, S&P wavered around the flat lines throughout Monday session as traders preferring to wait and see for progress on U.S.-China trade talks. For the day, the bench mark gauge to a gain of 0.1 percent. The Nasdaq Composite also gained 0.1 percent. The Dow Jones Industrial Average, however, lost 0.2 percent. The CBOE Volatility Index (VIX), widely considered the best gauge of fear in the market, rose 1.6 percent to 15.97. Transport stocks attracted strong buying support Monday led by gains from Norfolk Southern (NSC) and Avis Budget (CAR). Norfolk Southern rose after it announced a strategic financial plan to target a full year operating ratio of 60% by 2021. Avis Budget rose after Goldman Sachs “double” upgraded the stock to ‘Buy’ from ‘Sell’ and increased its target price to $35 from $30, citing improved attractiveness in its valuation and seeing its positioning as favorable versus industry peers. As such, the SPDR S&P Transportation ETF (XTN) rose 1.15 percent on the day and is up nearly 15 percent YTD, outperformed the S&P. Now the question is whether the rally has more legs? Below is an update look at a trade in XTN. Our “U.S. Market Trading Map” painted XTN bars in green (buy) – see area ‘A’ in the chart. 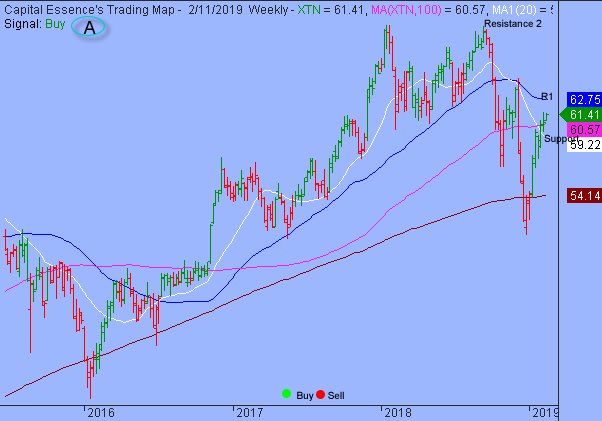 XTN has been on a tear in recent months after the late 2018 selloff found support near the 4-year moving average. The January rally pushed the ETF above resistance at the 2-year moving average, a key technical level based on moving averages. This week’s upside follow-through confirmed the bullish breakout. This is a positive development and opened up for a test of the more important resistance near the 63 zone. A close above that level has measured move to 69, or the 2018 highs. XTN has support near 59. Short-term traders could use that level as the logical level to measure risk against. Short-term technical outlook remains bearish (sell). Last changed February 7, 2019 from bullish (buy) (see area ‘A’ in the chart). S&P continues basing sideways near the lower boundary of the pink band. That level was significant when the index climbed above in late January. The big picture remains the same. 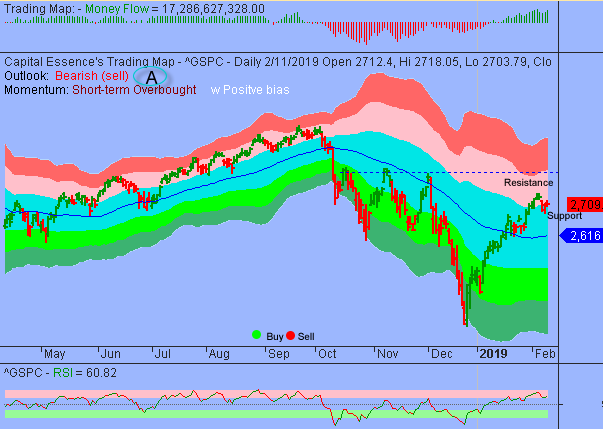 There is a consolidation within the 2700-2740 trading range, which represents digestion period in the after math of the January massive rally. Money Flow measure hovers the highest level since September 2018, indicating a positive net demand for stocks. This is a bullish development, suggesting that the index might have to move to a much higher level as soon as it works off excessive optimism. The early February high, around 2740, is the line in the sand. There is no reason to turn particularly bullish until this area is eclipsed. Short-term trading range: 2670 to 2743. S&P has psychological support at 2700 while key support is at 2696. A close below 2696 has measured move to 2670. The index has resistance near 2743. A sustain advance above that level has measured move to 2800. Long-term trading range: 2500 to 2940. S&P has support near 2620. A close below that level has measured move to 2500. The index has resistance near 2730. A close above that level has measured move to 2940. In summary, trading behavior in the S&P remains constrained by a short-term sideways pattern and shown little evidence of a sustainable change in trend. 2740 is the line in the sand. There is a no reason to turn particularly bullish until this area is eclipsed.